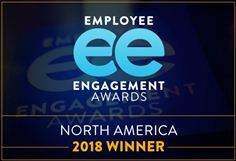 Chicago – June 08, 2018 – The winners of the North American Employee Engagement Awards, in association with Maritz Motivation Solutions, are announced today. Presented at the ‘sold-out’ North American Employee Engagement Conference in Chicago yesterday, the Employee Engagement Awards honour those organisations that put workforce engagement at the heart of their business strategy. This year's winners demonstrate that Employee Engagement is now central to organisations in almost every field of endeavour. They span government, hospitality, healthcare, IT, pharmaceuticals, retail, service companies and transport. The EE Awards moves next to Sydney for the Australian and New Zealand Employee Engagement Conference and Awards. This year it will be held at The Sydney Cricket Ground on November 15, 2018. Entries open on June 21, 2018 and will close on September 7, 2018. Entry forms are available here: https://anzeeawards.awardstage.com/. Highly Commended - PVH Corp.
That's why we created, and continue to develop, the Employee Engagement Awards. Our goal is to provide a platform to recognise excellence in engagement that inspires action and drives the employee experience forward.